Vulcan – 5 Reel, 25 Payline progressive video slot with a Wild symbol, Scatter symbol, Multiplier, Free Spins and a maximum Jackpot win of $3,000. 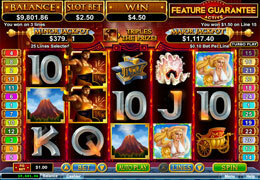 This slot is based on Vulcan, the God of Fire from Greek mythology who lives inside an active, bubbling volcano. Vulcan works as a blacksmith creating weapons for his superhuman friends. Volcano, Goddesses, Temples, Chariots, Oysters, and card symbols 10, J, Q, K and A. The Vulcan Wild appears on reels 2 and 4. The Wild revolves around in groups which meaning it’s possible to fill the whole reel. All wins created by the Wilds get tripled. 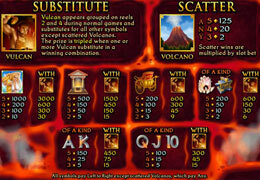 3 or more Scatters will trigger the Fire of the Gods feature which awards 15 free games and a 2x multiplier. This bonus round can be re-triggered 3x and each time 5 more spins get added and the multiplier grows from 3x to 30x to an incredible 300x on the final round! 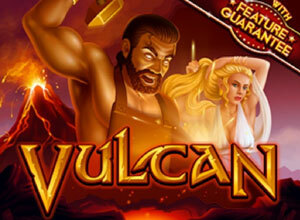 Vulcan is an impressive game with a fiery theme, excellent graphics and sound effects. Players can win some serious cash with the random progressives and bonus game.